Dade County, Missouri, figures prominently in my struggles to connect great-great-grandfather James C. Reagan to whom I think is his father: William Henry Reagan (b. 1797 and son of John, 1766-1843). 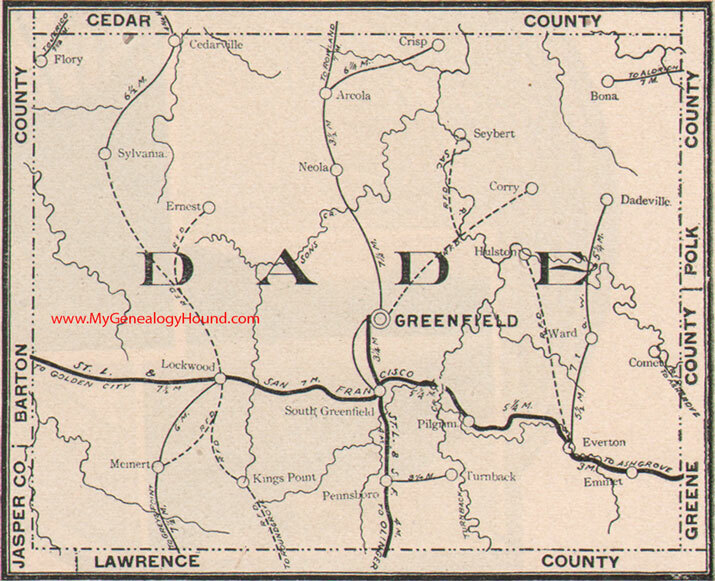 Dade County organized on Jan. 29, 1841, from Barry and Polk counties. The county seat is Greenfield, MO 65661 (7,923 residents). The courthouse burned on Oct. 6, 1863.
six females. I'll have to check out the microfilm of the original census to put them in the proper age bracket. It's hard to tell in the printed index, but that coincides with the number of children William Henry and Margaret Cunard had, with one male being absent (was the eldest, James, 20, already on his own?). Also in Barry County, 1840, is a John Ragan, aged 70-80. He is the only one in his household. This is William Henry's father, John, born about 1766, who married Martha Black in 1788. He died on Nov. 13, 1843, in Dade County. According to a Tennessee cousin, that is John B. Reagan who was in Hardeman Co., TN., in the 1820s before he moved to Missouri. Many of the girls married in Tennessee and John served as the first coroner of Hardeman Co. Decendants of Charles C.C. Reagan, a son of John, who died in Tennessee are still in Hardeman Co. and have the given name Reagan. John B. left a will in Dade Co. MO in 1843 with the following children named: Elizabeth Henry, eldest daughter; Jane Crawford, 2nd daughter; Margaret Robertson, 3rd daughter; Celia Foren, 4th daughter; Mary Hatley, 5th daughter; William (Henry) Reagan, eldest son; Charles C.C. Reagan, 2nd son; Martha Webster, 6th daughter; Joseph V. and John B. Reagan, two youngest sons.